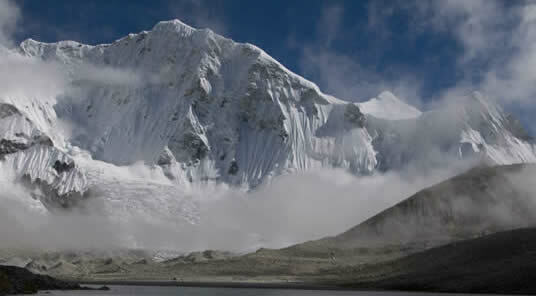 Baruntse (7220m) is situated in Nepal between Everest and Makalu. Due to the remote but central location, the summit of Baruntse affords spectacular views of well known Himalayan giants yet remains an expedition with a more adventurous quality than those in the more traveled valleys. The Baruntse massif is flanked by the Barun Glacier to the East, the Hunku Glacier to the South, and the Imja Glacier to the Northwest. It was first climbed by a New Zealand expedition led by Edmund Hillary in 1954 soon after Nepal opened to tourism. The South East Ridge was the first ascent route and will be our objective for this expedition. 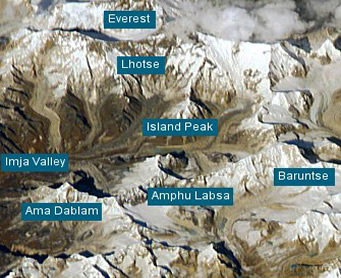 Most expeditions establish two high camps when ascending the SE Ridge on Baruntse. Camp I is set below the East Col. (5,700m). From Camp I the route leads across the East Col and descends steep slopes. A ramp system or snow plateau then traverses to the base of the SE Ridge where we establish camp II (6420m). From Camp II the climbing is steep snow and intermittent ice up to fifty degrees. Gaining the west side of the ridge the climb continues with challenging steps of rock and ice finally reaching a distinguished cleft and easier slopes to the summit. The climbing route has interesting but short technical sections and maintains a wonderful esthetic on the back bone of an exposed ridge. The crux of this route is a steeper section of ice around 7,000m which varies in challenge depending on conditions. The descent follows the climbing route back to Base Camp. Traversing three passes (Tashi Lapscha, Renjo La, & Cho La) with many panoramic views of the Himalayan giants; Everest and Cho Oyu, this journey into the heart of the Khumbu wilderness is a spiritual banquet for the mountain enthusiast. Descending Cho La Pass into Lobuche we begin our approach to Baruntse passing through Dingboche into the Chukungh Valley. The massive south face of Lhotse (one of the biggest mountain walls in the world) forms the left side of the valley, and Ama Dablam and Amphu Lapscha tower to the right. 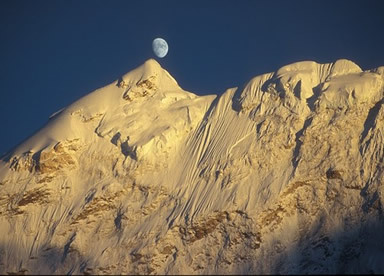 The northwest face of Baruntse cradles the Imja Khola glacier at the head of the valley. Our expedition will exit the Chukung Valley via Amphu Lapscha Glacier ascending Amphu Lapscha Pass. Known as a technical and steep pass, a day at Amphu Lapscha Base Camp adjacent to the Hunku Glacier will prepare us for a long day crossing the moraine to Ponch Pokhari and eventually to Baruntse Base Camp beneath the SE Ridge.